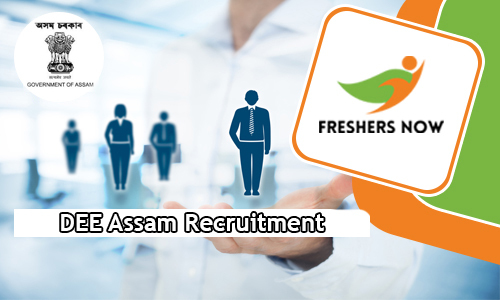 Recently, this new DEE Assam Recruitment 2018-2019 Notification is trending. And this caused some good hopes for the people who are looking for the Government Jobs in Assam. Surely a good chance for the people who want to get into the Teaching Field. There are total 9513 Vacancies. And these DEE Assam Openings 2018-2019 are for the Lower Primary Teacher, Upper Primary Teacher. So, all the people who are searching for the proper source to know the details can check this post. This article contains all the important information such as the Name of the Vacant post, Number of Vacancies available, Starting Date to apply, Final Date to submit the application, Educational Qualification, Age limit, Age Relaxation, Salary, Grade Pay, Application Fee, Recruitment Rounds. Along with these all, we are also giving some simple Steps. And these will guide the contenders, to apply for the DEE Assam Recruitment 2018-2019. DEE Assam Recruitment 2018-2019 Notification for 9513 Lower Primary Teacher, UPT Vacancies is out for a while. And many of the contenders are looking everywhere to know about this DEE Assam Vacancy 2018-2019. But many of the people are not able to find the correct place to get the complete details. Keeping this in mind. And to help the people we are here writing this new article. And it contains all the information that is mentioned in the DEE Assam Recruitment 2018-2019 Notification. So, all the contenders can check this post until the end to find out all the requirements correctly. So, as per the information in the advertisement, all the people who are eligible and have had all the qualifications can submit the application form in the prescribed format before the closing date. As per the info in the advertisement, the deadline is 19th April 2018. Find some important details that are given in the Official DEE Assam Recruitment 2018-2019 Notification. We have tried to fit all the important information in the table. Therefore, all the people who are willing to apply can check them. So, that they will get an overall idea about requirements. Now, as mentioned early to submit all the qualifications, you need to have the correct qualifications. Now, in the list, the first comes the educational Qualification. Each and every applicant need to do their B.A, B.Sc or diploma in elementary education along with Senior Secondary with at least 45% Marks as the Education Background. If you are having the above stated as the education, proceed to check the remaining information. After the Education requirement, the next priority goes to the Age limit. All the applicants need to have the correct age limit. As per the information in the official DEE Assam Recruitment 2018-2019 Notification, all the applicants should have an at least minimum age of 18 years. While the Maximum age of 38 years is acceptable. So, the officials of the Directorate of Elementary Education Assam will strictly check for the requirements that are mentioned in the advertisement. Therefore, we suggest the people, to apply for DEE Assam Recruitment 2018-2019 only if they are having all the Qualification correctly. Mere Fulfilment of the eligibilities will not qualify you to attend the Recruitment Rounds. So, keep this in mind and proceed to apply. Now, as per the notification, there is age relaxation too. Check it out properly. And apply if you are having relaxation. Next important thing all the job Hunters should be aware before submitting the application form is Application Fee. As per the information in the DEE Assam Recruitment 2018-2019 Notification, General Category people need to pay Rs.200/-. And the SC/ ST/ OBC/ MOBC Contenders have to pay Rs.150/- as the Application Fee. Please remember to check the advertisement twice before paying the application fee. Your application will be finalized only after paying the fee before the closing date. Therefore, if you are interested and have had all the qualification correctly, proceed to pay the application fee and submit the application form. And all the Job seekers should remember that their application forms will be rejected if they are submitted after the last date or if they are not having all the Qualifications correctly. Therefore, try to check remaining all information from the next sections of this article. Now, according to the information in the DEE Assam Recruitment 2018-2019 Notification, all the people who are eligible will have to face the Recruitment Rounds, if they want to get the job as the Lower Primary Teacher and Upper primary Teacher. Remember that the Merit and Performance shown in those rounds will be considered while finalizing the people for the Vacancies. According to the information in the Advertisements, all the applicants will have to go through the Written Examination next to the Personal Interview. Apart from that, the Contenders should also clear the Teacher Recruitment Test. Applicants will go to another round of the DEE Assam Recruitment 2018-2019 only if they clear the initial rounds. Therefore, keep this in mind and prepare well for the Tests. You can even find some preparation Materials on our site Freshersnow.com if you want to prepare. Now, coming to another information that is sourced in the advertisement is Salary. As per the notification, selected contenders are going to receive Rs.14,000 to Rs.49,000/- Per Month as the salary. For more confirmation, you all can check the advertisement. For sake of the contenders, here at the down of this post, we are attaching the notification. Simply by clicking on the notification, you can download it. SC/ ST/ OBC/ MOBC: Rs.150/-. All the contenders first go to the official site of the Directorate of Elementary Education Assam at dee.assam.gov.in. Then go to the advertisement section. Find the Official DEE Assam Recruitment 2018-2019 Notification. Look at all the details given in the advertisement. If eligible download the application.